If you do not know the wireless settings of your router, click here. NOTE: WGA54G v1 is only compatible with WEP Encryption. For WGA54G v2, make sure that you are using the latest firmware for it to support WPA Encryption (TKIP). Connect the Wireless-G Game Adapter to your router using an Ethernet cable. For instructions, click here. Access the Wireless-G Game Adapter’s web-based setup page. For instructions, click here. If you are using Mac® computer to access the Game Adapter's web-based setup page, click here. When the Game Adapter’s web-based setup page appears, look for the SSID field and enter the wireless network name. In this example, linksys is the network's SSID. Look for Network Type and select Infrastructure. 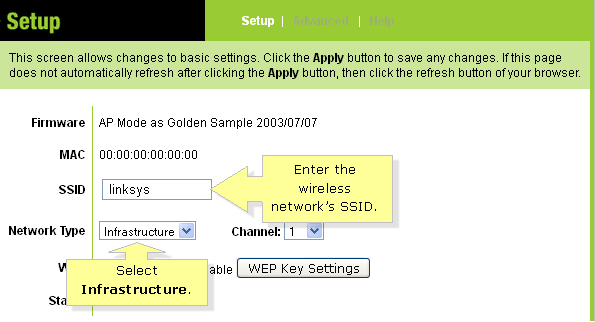 If WEP is not enabled on the wireless router, select Disable then proceed to Step 10. If WEP is enabled, select Enable then click WEP Key Settings. 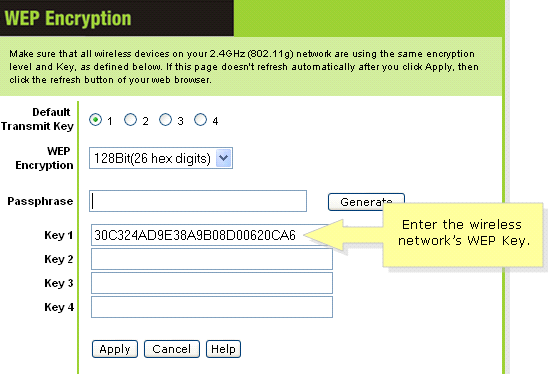 Once the WEP Encryption window appears, select the same Default Transmit Key as your router’s. In this example, we selected 1. Select the same WEP Encryption level. Either 64Bit(10 hex digits) or 128Bit(26 hex digits). 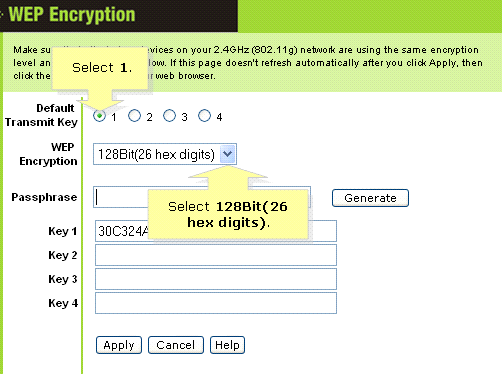 In this example, we selected 128Bit(26 hex digits). Enter the wireless network’s WEP key. Since we selected Key 1, use the WEP key in the Key 1 field. When the Setup page appears, scroll down then click Refresh and select your wireless network’s SSID. Once your SSID is selected, click Connect. Click Apply to complete setting up the Game Adapter.